(Peter Hvizdak - New Haven Register) Governor Dannel P. Malloy and State Department of Education Commissioner Dianna R. Wentzell announced during a press conference at Hillhouse High School Monday morning, April 1, 2017 that graduation rates in the state reached an all-time high during the 2016 school year. HARTFORD - Connecticut public school students are taking and passing more Advanced Placement tests, state officials announced on Friday. Using Hartford public school students as a backdrop, Gov. Dannel P. Malloy and Commissioner of Education Dianna Wentzell proclaimed the news as proof that school reform efforts over the past eight years are taking hold. The results show improvements among all racial and ethnic backgrounds and the state’s Alliance Districts, which get extra state support and scrutiny. 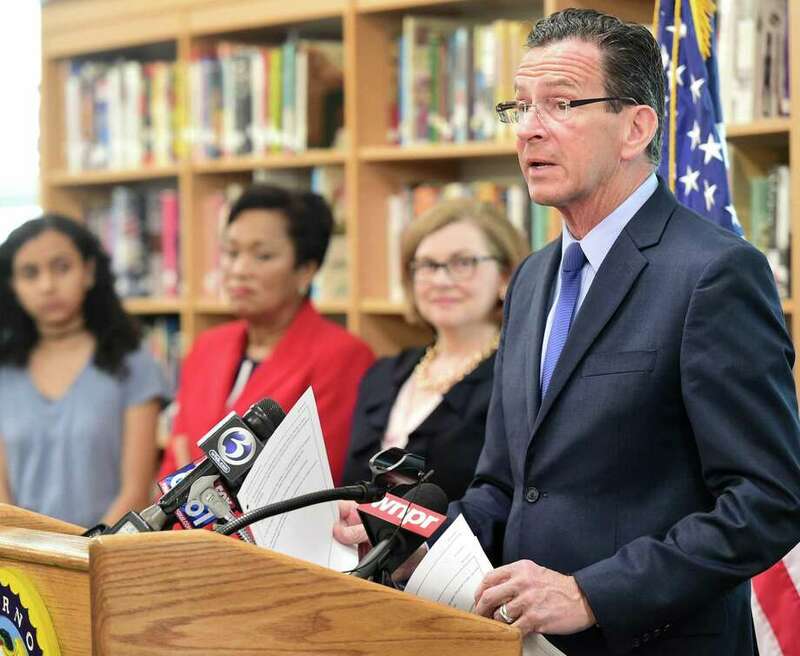 “Over the last eight years, my administration has worked to ensure that every student - regardless of his or her ZIP code — has the opportunity to succeed in Connecticut,” Malloy said. Participation rose 10.4 percent among black student since 2015 and 12.2 percent among Hispanic students. Performance for both groups also improved. Advanced Placement courses are given in school. The exams, offered by the College Board, are taken in May. They offer the promise of college-level rigor and the possibility of college credits for high school students who achieve a score of 3 or above. Results released Friday represent all students who took the test in the past school year, not just seniors. In 2017-18, the number of students who took at least one AP exam rose to 30,411 - an increase of 5 percent from 2016-17. Those students took 55,738 exams, also an increase of 5 percent from the prior year. Of the exams taken, 37,804 achieved a score of 3, 4 or five — an increase of 3.8 percent from 2016-17. Locally, Bridgeport saw a 161 percent growth in test takers — 239 to 623 — and a 96 percent increase in exams that scored 3 or better — 263 in 2018. Last year, Bridgeport offered 20 AP courses, compared to 12 in 2015. Other districts increasing both participation and 3-or-better scores include Fairfield, Milford, Oxford, Seymour, Shelton, Stratford, Trumbull and Westport. Fairfield, which offers 28 AP courses between its two comprehensive high schools, had a 9 percent growth in testers, to 739, and a 3 percent growth in passing scores. Fairfield Schools Superintendent Toni Jones said she was extremely proud of the work the Fairfield staff is doing to increase equity and access for all students in areas such as AP courses. “Encouraging more students to take AP courses and opening up access was our goal, and we are very pleased to see an increase of 9 percent in test takers,” she said. Westport and Greenwich both offer 31 AP courses in their high schools. In Stratford, there was a 75 percent increase in test takers, from 205 to 359, with a 14 percent increase in scores of 3 or better. There, the number of courses offered increased from 14 to 16. Malloy said improvements are the result of outreach and potential. When coupled with seven straight years of graduate-rate increases and improvements on the state’s Smarter Balanced Assessment, the improvement in the state’s education system is real, the outgoing governor said. To improve access and participation, the state paid fees not covered by the College Board for low-income students to take AP exams in spring of 2018. The standard fee is $94 per exam before deductions. In the 2017-18 school year, 4,418 students — about 13.4 percent of test takers — received free reductions. The state also sends letters to students who do well on PSAT exams, encouraging them to participate in AP courses and exams. For the Class of 2017, 31 percent of seniors took an AP test and scored a 3 or better. The national average that year was 22.8 percent.